Christmas is right around the corner, and you have that one person on your list who has everything. On top of all that, you really don’t know what to get because they are a coaster enthusiast, and what do you get a coaster enthusiast that they don’t already have? 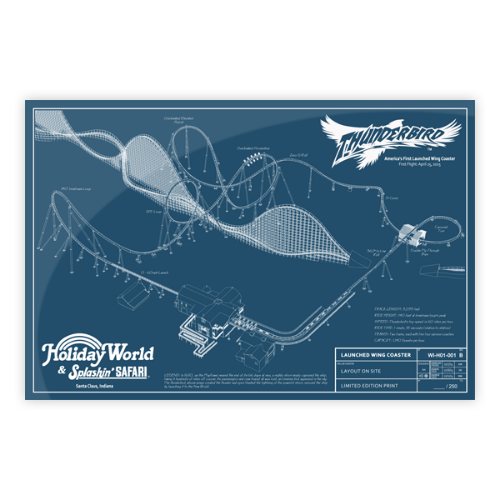 Holiday World has the answer with their all new Thunderbird merchandise! The items are inspired by the all new record breaking coaster, so it’s sure to be a hit with the enthusiasts on your list. The official Holishop on the Holiday World website is giving last minute shoppers something to stuff stockings with. The park has an all new section devoted to their record breaking coaster, Thunderbird. Gifts range from shirts and mugs to awesome frameable gifts like the complete blueprints for the ride. 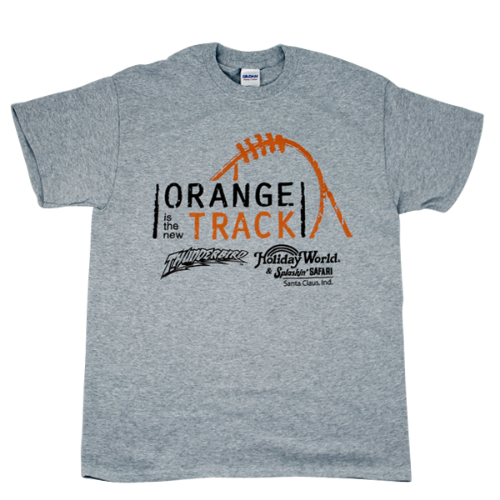 One of our favorites is the shirt that features the clever catch phrase about the new orange track. As a added holiday bonus, all orders over $25 dollars get free shipping. Order before December 22nd at 10 am (Central Time) and get it shipped out the next day. Thunderbird will open in April of 2015 and will be the world’s fi re at launched wing coaster. The coaster is the first steel coaster at the park, and is creating a huge buzz with the way that it will entwine with other coasters in the park, which will give it a very unique riding experience. Stay tuned for more from Thunderbird, and be sure to get social with us on Facebook and follow along with us on Twitter @Behindthrills for the latest updates! For more information about Thunderbird at Holiday World, including tickets, visit the official website by clicking here! Previous PostClyde and Seamore go back to school in 2015 at SeaWorld San Antonio in all new show Next PostChloe the Clown makes a huge debut at Universal Orlando's Holiday Celebration!